made up entirely of insightful, profound, and occasionally ridiculous questions. 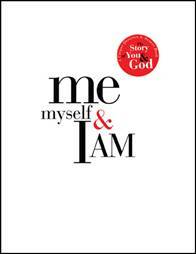 Me, Myself, and I AM invites you to open to any page, open yourself to God, and be the author of your own story. You overhear God talking about you. What do hear him saying? You are on a long car trip with a close friend who is not a Christian and the conversation turns to faith. What is your biggest fear about what your friend will ask or say? Do you believe that all of Jesus’s followers have a responsibility to tell others about him? Me, Myself, and I AM will inspire, and get you thinking about your spiritual life from entirely new angles. You can use Me, Myself, and I AM as a reflective tool, a way to start conversations with friends and family, or as a spiritual time capsule to look back on years later. To sum it all up, this book is more than just another book. This book helps you to see better – to see yourself, God and the world around you through a new third person awareness lens. You won’t be disappointed in the results! You can find Me, Myself & I AM at Amazon, Books a Million, Barnes and Nobles, or your local Christian bookstore. This entry was posted on November 5, 2008 at 5:08 pm and is filed under Awareness, Books I'm Reading, Life, Uncategorized. You can subscribe via RSS 2.0 feed to this post's comments. You can comment below, or link to this permanent URL from your own site.